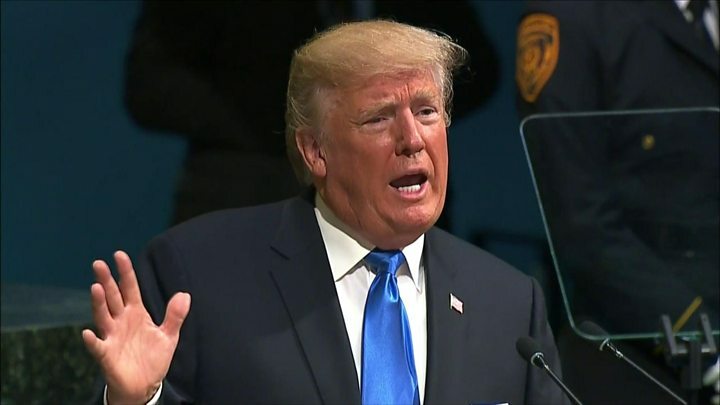 Donald Trump at the UN: What were his key messages? 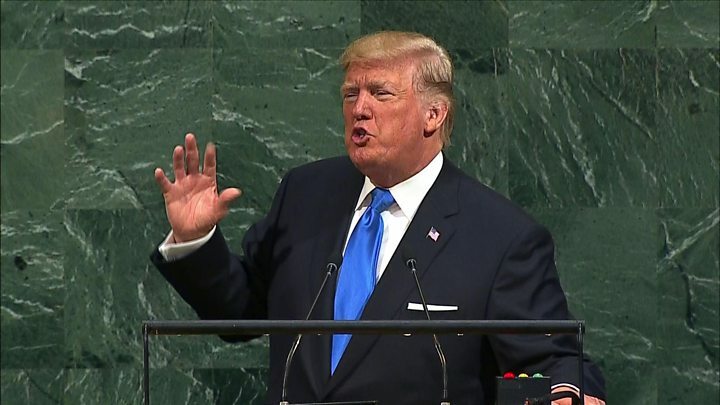 America first, a rogue Iran, the fight against so-called Islamic State (IS) were highlighted in President Donald Trump's first speech at the UN General Assembly. 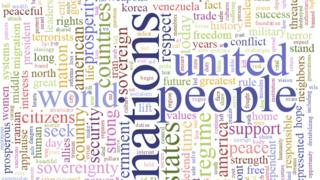 The landmark foreign policy address laid out a Trumpian vision of a world organised into proud, sovereign nation states. Here are some of the key takeaways. Mr Trump modified his long-standing "America First" election rhetoric into something more tailored to the audience of international leaders and diplomats. "Our government's first duty is to its people, to our citizens - to serve their needs, to ensure their safety, to preserve their rights, and to defend their values," he said. Media captionWhich 'rogue states' are in Trump's new axis of evil? "As president of the United States, I will always put America first, just like you, as the leaders of your countries will always, and should always, put your countries first. "All responsible leaders have an obligation to serve their own citizens, and the nation state remains the best vehicle for elevating the human condition." 'America First'. Who will be second? Towards the end of his speech he asked the room: "Are we still patriots?" "Do we love our nations enough to protect their sovereignty and to take ownership of their futures? Do we revere them enough to defend their interests, preserve their cultures, and ensure a peaceful world for their citizens?" 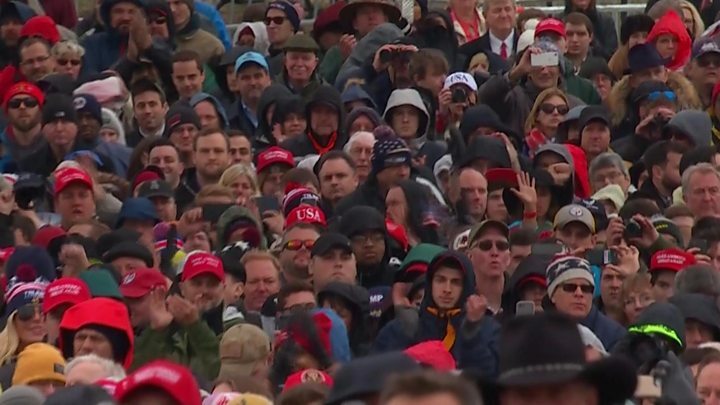 Under him, Mr Trump said, the US was "calling for a great reawakening of nations, for the revival of their spirits, their pride, their people, and their patriotism". Early on, Mr Trump turned his fire on some of the ambassadors sitting in front of him, saying "rogue regimes represented in this body not only support terrorists but threaten other nations, and their own people, with the most destructive weapons known to humanity". 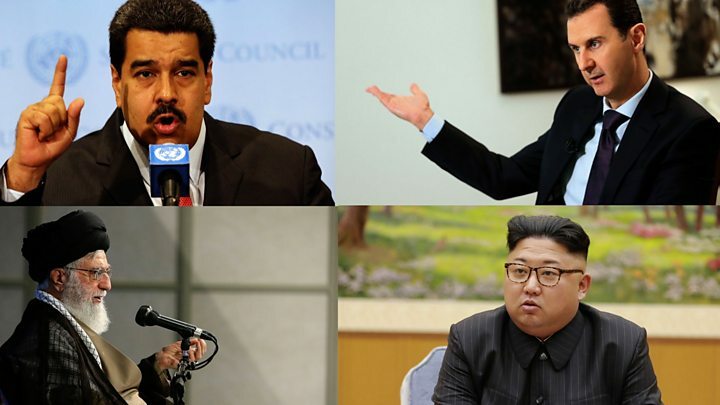 "The scourge of our planet today is a small group of rogue regimes that violate every principle on which the United Nations is based," he later added. "They respect neither their own citizens nor the sovereign rights of their countries. "If the righteous many do not confront the wicked few, then evil will triumph. When decent people and nations become bystanders to history, the forces of destruction only gather power and strength." The current crisis on the Korean peninsula received plenty of attention from the president. He started with a reference to US citizen Otto Warmbier and others who have died or been imprisoned at the hands of North Korea. "If this is not twisted enough, now North Korea's reckless pursuit of nuclear weapons and ballistic missiles threatens the entire world with unthinkable loss of human life," Mr Trump said. "It is an outrage that some nations would not only trade with such a regime, but would arm, supply, and financially support a country that imperils the world with nuclear conflict. No nation on earth has an interest in seeing this band of criminals arm itself with nuclear weapons and missiles. "Rocket Man is on a suicide mission for himself and for his regime," he said, mocking North Korean leader Kim Jong-un. But he added that he hoped conflict wouldn't be necessary since "that's what the United Nations is for". Iran's ambassador lowered his spectacles as Mr Trump started talking about his country. "The Iranian government masks a corrupt dictatorship behind the false guise of a democracy," he began. He continued: "It has turned a wealthy country with a rich history and culture into an economically depleted rogue state whose chief exports are violence, bloodshed, and chaos." The US president accused the country of funding terrorists who "attack their peaceful Arab and Israeli neighbours", and then returned to a favourite topic of scorn - the 2015 Iran nuclear deal. "Frankly, that deal is an embarrassment to the United States, and I don't think you've heard the last of it - believe me," he warned. Donald Trump declared that he had "made big gains toward lasting defeat of Isis", using another acronym for IS. "We appreciate the efforts of United Nations agencies that are providing vital humanitarian assistance in areas liberated from Isis, and we especially thank Jordan, Turkey and Lebanon for their role in hosting refugees from the Syrian conflict," he said. On the Syrian war, he also said that the US was seeking "de-escalation... and a political solution that honours the will of the Syrian people". "The actions of the criminal regime of Bashar al-Assad, including the use of chemical weapons against his own citizens - even innocent children - shock the conscience of every decent person." Has UN staffing doubled since 2000?